Get comfortable, and get ready for an Epic adventure! In fact, Max Quest Wrath of Ra is a milestone game by Betsoft that gives you the chance to experience a never before seen genre in the casino industry. And we will even be so bold and say that this is not a video slot! Although it’s still an RNG (random number generator) game, it takes its inspiration from video games and RPG (Role-Playing Game). In fact, in Max Quest Wrath of Ra, you can customise your avatar. Play with up to 6 players at the same time and team up to complete Dungeon Quests. Alternatively, you can complete individual missions such as defeating mummies or collecting rare treasures to earn XP (Experience Points) to improve your character! So, if you are looking for a ground-breaking game. Look no further, Max Quest Wrath of Ra is for you! Type: RNG game, Interactive Shooting. In Max Quest Wrath of Ra, the main bonus feature is the God Event and here’s how it works. After a round finish, a Pharaoh God can appear on your screen. But keep in mind that, the God Event won’t always be triggered once a round end. When a God appears he’ll fight you and your team. And your goal is to kill him and his mummy guards to collect the bounty. The strength of the God is on the right-hand side of your screen. And it’ll decline with every shot you and your mates’ fire. After sending the God back to where he’s from, the bounty that includes, cash prizes and collectible separates between you and the team. The size of your reward is in relations to how many shots you fired during the entire round leading up to the God Event. As ground-breaking as the concept of Max Quest Wrath of Ra is, so are the Free Spins rewards you’ll get. So as you take down “Shadow Scarabs”, “Crimson Bataana’s” left and right, you not only collect cash prizes, but you’ll also obtain the special weapons they’re carrying, and abilities too! After successfully killing any enemies, 8 different prizes can drop, including special weapons pre-loaded with ammunition that adds to your inventory. Since the special weapons don’t consume your bought bullets, the effectively acts as Free Spins. Additionally, these special weapons can be purchased in-game for maximum effect! Plasma Gun: is the most powerful gun, that targets 1 enemy at a time. Rated 5 stars. Laser Rifle: is the second most powerful weapon and it can ricochet to one additional enemy. Rated 4 stars. Machine Gun: Has the same power and ability as the Laser Rifle. But, uses bullets instead of a laser. Rated 4 stars. Grenade: is your AoE (area of effect) friend when the screen fills with enemies. In fact, this weapon targets up to 5 enemies at the same time. Rated 3½ stars. Shotgun: is the weakest of the special weapons. But still, packs a big punch, one enemy at the time. Rated 3 stars. 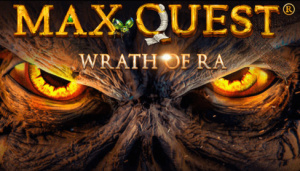 Max Quest Wrath of Ra is the latest addition to Betsoft Gaming portfolio, and it’s well worth learning it. Indeed, not only is the concept of a free flow style layout something missing in the industry. But, the level of interaction and engagement is truly mind-blowing! We predict that Max Quest Wrath of Ra will win several awards this year. And, the best part of Max Quest is that it caters for all types of players. Sure, at first glance, it looks complicated. And by all means, it’s not a “let’s try a couple of spins” type of game. You’ll need to invest a bit more time to understand the mechanics and functions. But when that’s done, you have a game that will give you hours of fun, excitement and big wins too! Try it now and have fun!